Every year around early to mid November I make my pilgrimage to a couple chosen lakes for some of the best brook trout fishing of the year. 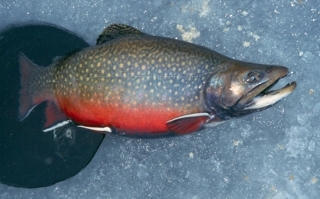 At first ice, brookies will be spawning, normally in shallow water over gravel beds if available. Barring that, they will pick any suitable shoreline, set up shop in two to six feet of water and have at it. This is great for fishing because we can drill a bunch of shallow holes and if they’re around we’ll see them swimming under our toes. This year, however, with school, exams, and various family commitments coupled with a good bout of the flu my early winter brook trout expeditions were sidelined. Still wanting to get out, I was faced with the option of heading out over the Christmas break which is not a time that I normally go fishing. I did a quick poll of my friends and found my buddy Trevor McLeod was interested in joining me to try our luck with the brookies at this time of year. 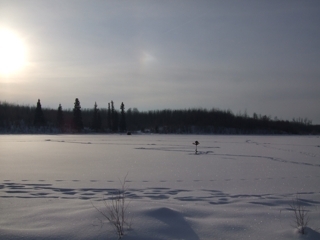 We loaded up his truck with my sled, all of our ice fishing gear and headed out. It was fun getting to go out fishing once again and I looked forward to the day ahead. As we got close to the lake a heavy blanket of snow prevented further travel. 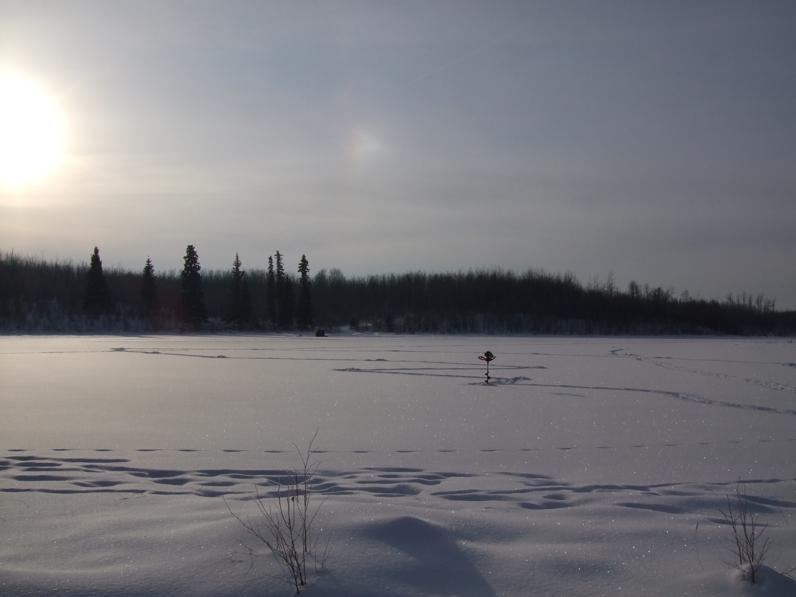 We unloaded the truck, packed up the toboggan and with everything in tow walked the last three hundred meters to the lake. 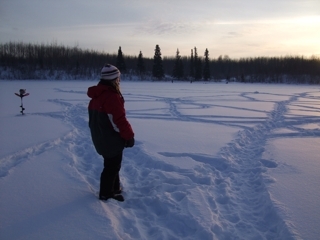 The heavy snowfalls had piled up on the ice and within seconds my heart skipped a beat. There were several centimetres of slushy water in my footprints. A healthy dose of flood ice was playing havoc and I was concerned whether the ice was safe to walk on. I fired up the power auger and drilled a hole to find eight inches of solid clear ice under the surface slush which made me feel a lot better about the day. Looking around I noticed we were near a beaver house. In previous outings I’ve had a lot of success fishing in these areas so we drilled a pattern of holes covering depths of two to about seven feet. Provincial regulations allow two lines each while ice fishing so we set out four set lines. Two had straight worms on them, one was rigged up with a jig and worm and the other had maggots. With our lines down we hung out and waited...and waited...and waited. In a couple hours we hadn’t got a touch and I was beginning to wonder whether there actually were any trout in the lake or if it had winterkilled. That has happened to me before when fishing small lakes in the woods. After a few hours I told Trevor I was going to change things up. 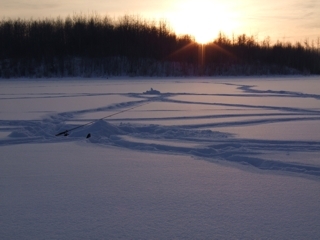 I fired up the ice auger and drilled a pattern of holes out deeper. Perhaps the fish were finished spawning and had migrated to the deeper water. I drilled a couple dozen holes from eight feet to about 14 feet. Trevor put on a large jig and tipped it with maggots. He went out to one of the deeper holes in about 12 feet of water and within seconds I hear something like “Oh darn!” and looked up. “I just had a bite,” he said, prompting me to try a small yellow marabou jig tipped with a worm and dropped all the way to the bottom. A couple shakes and slowly lift. In less than five minutes I felt something on the line and set the hook. 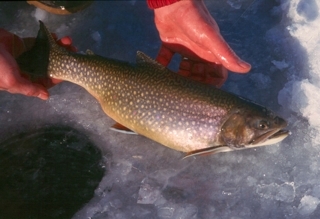 The light ice fishing rod doubled over and as I worked the brook trout closer to the hole I could tell it was a decent fish. It took several attempts and a bit of coaxing to bring him up through the hole, but when I did, I landed a beautiful brookie of about a pound and a half. 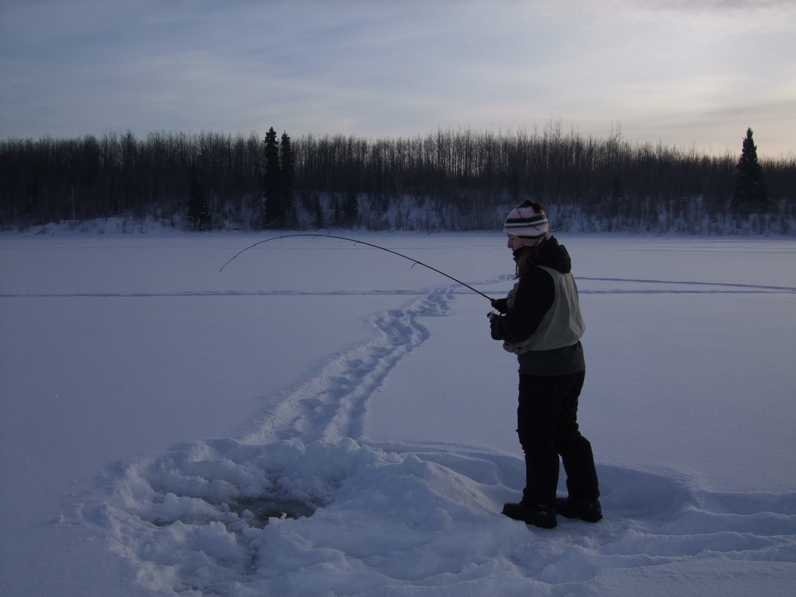 With that immediate success I moved my set line with the trout worm out to the deeper water. It turns out we were on the bottom edge of a sharp drop that went from six to 12 feet of water. With the worm rig on my set line I would get a bite every few minutes and connected with three more brookies, including a couple I kept for dinner. Trevor also caught a decent one. I cleaned the larger one at the lake and found that they had spawned out which left them no incentive to stay in shallow water. They had moved deeper and were actively feeding on the deep edge of the first drop off. Now knowing where they were hanging out, it was just a matter of finding something they wanted to eat. It turned out that trout worms fished near the bottom was all that was needed to get bites. Now that I had found brookies in numbers that were biting after the spawn, I decided to head back this past weekend to my favourite brookie lakes with my girlfriend Melanie. We combined a camp out complete with a hot dog roast with the fishing and caught a number of good brookies using set lines and worms. 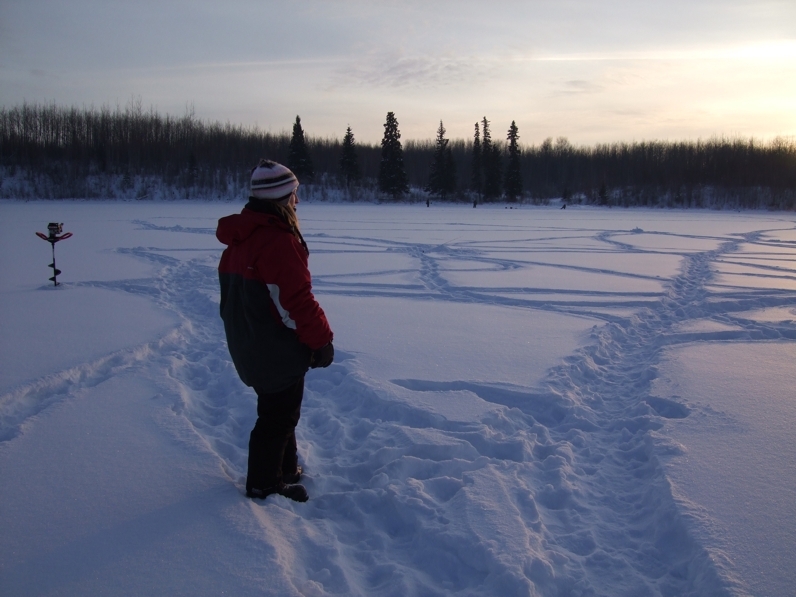 The really cool thing was that we walked over to an entirely new part of the lake that neither of us had fished before. When we got there we found the drop off, put down our lines and caught fish. Looks like we’re on to something.